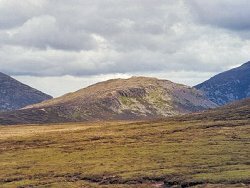 South-western flank of Ben Crom, Mournes, Co. Down; line of crags above scree exposes roof contact of G3 granite beneath overlying G2 granite. Other interest: ring-dyke, Contact, Intrusion, Sheep grazing, hill walking. The Mourne Mountains are composed of a mass of granite which has been unroofed by erosion. In fact, five granites are present in the Mournes and they appeared in succession, the first three in the east and the last two in the west. This site exposes the contact between the second and third granites (G2 and G3) and, over long clear outcrops, shows the relationship between them and the nature of the emplacement of G3. On the south west shoulder of Ben Crom, overlooking the upper reservoir in the Silent Valley, the contact between the G2 and G3 granites is clearly exposed and can be traced eastwards over the south face of the mountain onto the more difficult and less accessible cliffs on the east side. In this area G2 is medium grained and G3 is much paler and finer grained. The line of contact is crisp and almost horizontal, inclined gently to the west and the G3 granite immediately below is chilled against its G2 roof. This more rapid cooling against relatively cold G2 has led to a finer grainsize near the contact. In the final stages of the cooling of G3, pockets of gas created cavities that were later lined with large crystals (these coarse crystalline rocks are called pegmatites), some with the mineral beryl in the form of poor quality aquamarine. This near-horizontal boundary adds support to the ring dyke explanation of the structure of the Mourne granites. In this, a large conical fracture, many kilometres across at its base, is initiated above a mass of molten rock at depth. The unsupported cone of country rock (the name given to any enclosing rock formation) subsides into the molten magma which is then extruded from its chamber into the fracture to accumulate above the blunt termination of the cone in the form of a laccolith (a body of igneous rock with a flat base and domed top). Each of the granites in the Mournes is thought to have been emplaced in roughly this way. On the summit of Ben Crom there are dykes of basic rocks and feldspar porphyry that must have been intruded at a late stage in the history of the granites. The date of formation of the granites has been determined from their radioactive isotopes and is generally agreed to have been 56 million years ago. The Mourne Mountains provided much fundamental information on granite emplacement and this site, with the associated quarry in G3 further down the hillside overlooking the dam, presents a clear illustration of the process along an important contact. The initial elucidation of the structure of the Mourne granites was also a classic piece of mapping and interpretation, conducted by J E Richey and published in 1927. The site is an Area of Special Scientific Interest (ASSI), a status that should offer all the protection such a remote and robust locality needs.